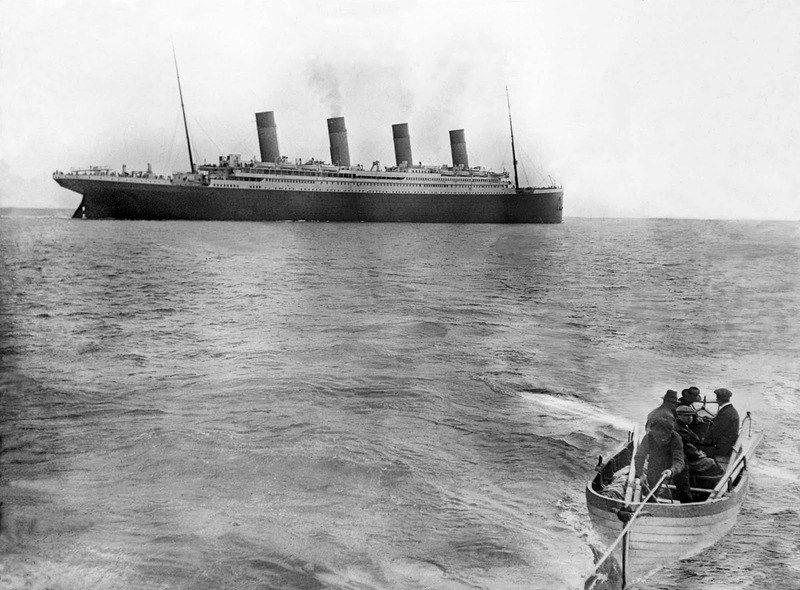 The last known photo of the Titanic afloat. Photo taken on April 12, 1912. This photograph is the last known picture of RMS Titanic on the surface of the ocean. It was taken during her maiden voyage at Crosshaven, Ireland, just after the vessel departed Queenstown where it had stopped before heading westwards towards New York. Three days after this photo was taken 1,514 people would be dead and the Titanic would be on the bottom of the North Atlantic after colliding with an iceberg in one of the deadliest peacetime maritime disasters in history. According to Time Magazine this photo was taken by Irish Jesuit priest Francis Browne who sailed with the ship for the first leg of its journey, from Southampton (England) to Cobh (Ireland) then called Queenstown. The priest would have stayed for the remainder of the transatlantic journey too, having received an offer of a ticket from a wealthy family he befriended while on board. When Browne reached Cobh, however, he received a note from his clerical superior, ordering him to return to his station immediately rather than sail on with Titanic. Why did the Titanic sank? The Titanic was considered practically “unsinkable” because it was designed to stay afloat in the event the hull was pierced and internal flooding occurred. The design was based on the division of the hull into 15 transverse watertight bulkheads with each one incorporating watertight doors. The doors could be closed automatically in the event of an accident. However, the compartments formed by the watertight bulkheads were not independently watertight. This was a major design flaw. If water filled a compartment higher than the top of a watertight bulkhead, then the adjoining compartments would flood. The design team assumed that this situation was impossible since all bulkheads rose to a level above the waterline. It was strongly believed that when the Titanic hit the iceberg, a 350 foot gash was torn in the starboard side of the forward hull. The huge gash in the bow allowed water to infiltrate the ship and cause six of the sixteen watertight compartments to flood. The Titanic was designed to stay afloat if 3 or possibly 4 compartments flooded. As the sea rose above the watertight bulkheads, adjoining compartments filled with water (a simple way to conceptualize how Titanic flooded is to think of what happens when you fill an ice cube tray with water). The added water weight pulled Titanic’s bow deeper into the ocean until the great ship gave up its fight and finally sank. The fourth funnel was just for show, it had no real purpose. Actually while it served no purposes as an exhaust for the boilers rooms, it did serve as an extra ventilation shaft and vent system for the galley. The ventilation shafts did not require the funnel, the fourth funnel was more about the prestige, just for show. The designers thought the ship would look more impressive with four funnels rather than three.